Hide windows on desktop & tabs on taskbar, boss! Say, while at work you are surfing internet instead of doing office work. Your boss is coming and you quickly close all windows on desktop showing non-office work content. Hey, why not hide those windows instead of closing them? And continue browsing them when boss is out of the view! Clicky gone free application allows you to do the same. You can install it on your office computer or carry the portable version in your USB drive. Few keys combo will hide windows on desktop and even window tabs on the taskbar. It is also a good way to hide sensitive information being processed on the computer while other people are moving around. Once you get comfortable with keyboard shortcuts to quickly hide and reveal windows, this can be your ideal companion at work and even at home with other family members trying to find out your computer adventures. 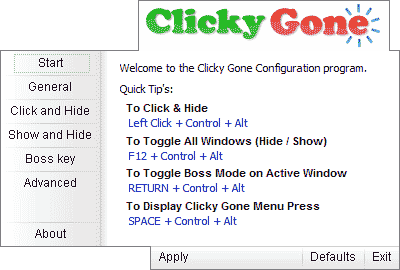 Download Clicky gone and make windows / tabs GO at click of few keys!